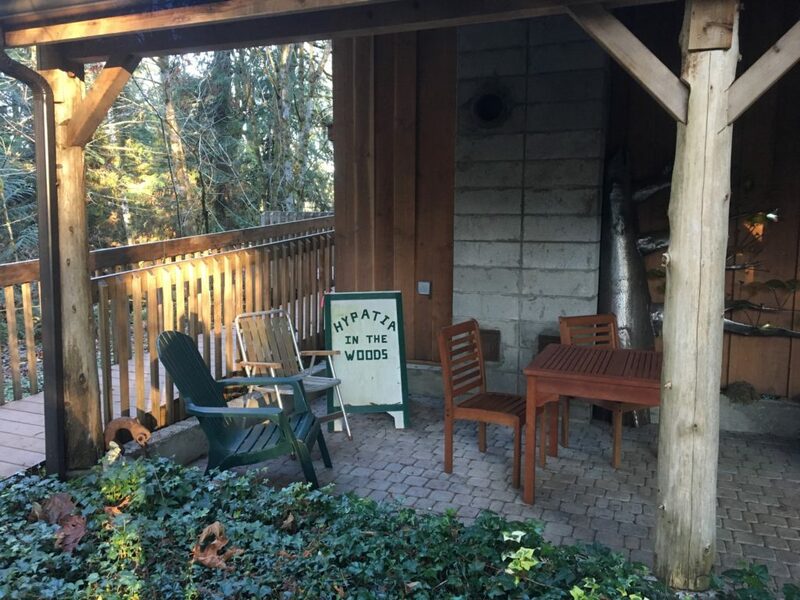 I was honored to be accepted as a resident at Hypatia-in-the-Woods in Shelton, Washington from December 2-15, 2018. This place offers time and quiet workspace for women writers, artists, musicians, and entrepreneurs of all types and styles. I spent two weeks alone in Holly House, a cabin surrounded by trees, working on my book project about national monuments. This was my first writing retreat experience, and it was both more difficult and more productive than I anticipated. Following are a few thoughts and notes from my journal during my time there. I have arrived. I transitioned from the drought-familiar desert to the misty and moist Pacific Northwest. It is lovely and green here, and the cabin is adorable. I don’t know how to start. I have driven 14 hours and feel antsy and eager to move and explore. Here I am in a space dedicated to creation and now that I am here in the quiet…I feel bored. And anxious that I won’t be able to accomplish what I hope to. The pressure of having an opportunity like this and having expectations for myself is now getting to me. December 3: Lake Isabella State Park. I found a place to run and to explore the forest. 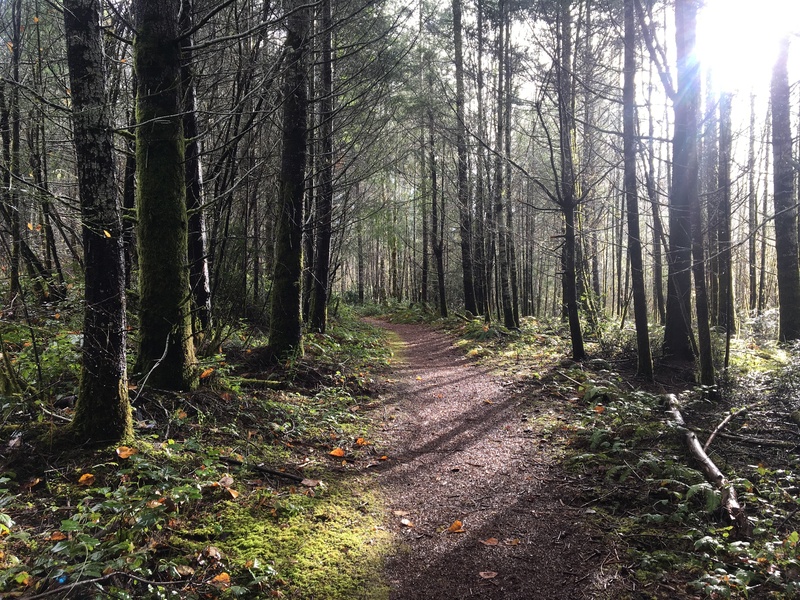 It is only a short drive away and has enough trails for me to take 3-4 mile runs. It is sunny today, yet I don’t need sunglasses in in this filtered light forest world. Thoughts and words bubble up as I run. A cork has been popped and words are foaming out. It is December but the forest is green. The ferns are vibrant, the moss is soft and tinged with yellow. Spanish moss coast branches in a furry lime sweater. The fringe glows where sunlight ruffles it. White bark takes on the greenish cast of tarnished silver in the dark forest understory. Celadon, olive, lime, kelly green, emerald, turquoise, evergreen, forest, fern, moss, lichen, leaf, hazel, teal, mint, yellow-green, green-gold, green-blue, beryl, seafoam, ivy, grass. Today is the one-year anniversary of President Trump’s reduction of Bears Ears and Grand Staircase-Escalante National Monuments. How fitting that I am spending it holed up in solitude, writing about them, honoring them. I am writing about the flushed desert of Utah in a setting that is exactly opposite. 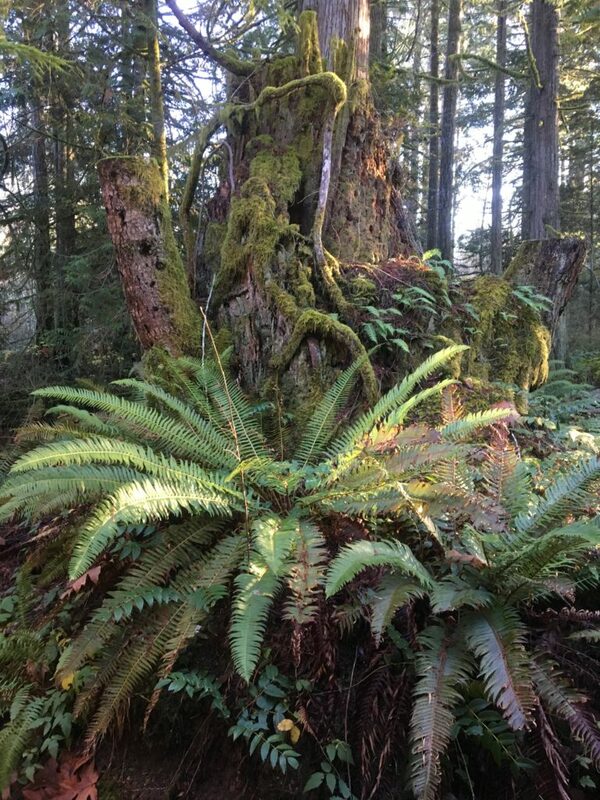 Instead of dry sand and red stone I am among wet ferns and evergreens. The green woods soothe my desert-tired eyes and my sun-cracked soul. I snuck down the gated road owned by the Manke Lumber Company to reach the shore of Hammersley Inlet. I aimed my binoculars at a flock of birds grouped on the water’s surface and admired the brown heads and red beaks of a flock of common merganser. I heard a curious wet snort and looked around to find the source of the noise. The slick face and curious eyes of harbor seal gazed at me above the water. I gasped audibly. This world was already my inspiration, my subject, and coming to a place that is fresh for me to discover has renewed my efforts to convey that passion on the page. Today writing was hard. I made almost no progress. I need to sort out what it is that I want to say., what I mean. I struggled, then read a work email that made me anxious, and then went for a walk in the rain back down to the inlet. Through my binoculars I counted off gray gulls bobbing on the water, then I sucked in a surprise breath as my lenses landed on a perfectly still bald eagle. I find a book about Hypatia on the shelf in the cabin and one night I curl up in bed and flip through it. It intrigues me, and I research more about her. This residency was dedicated in her honor, but I didn’t know much about her. Hypatia was born around the year 355 in the Egyptian city of Alexandria, which was under Roman rule, and she was brutally murdered in the year 415. Before her murder, she was a respected and beloved teacher of philosophy and mathematics. A female in her position was rare, but her gender did not dampen her reputation. She grew up under the tutelage of her father Theon, also a mathematician, and she went on to write commentaries on several important mathematical works, which was a common strategy of her time. Hypatia invented a more effective form of long division (though this system still used clunky roman numerals) and she taught that the cosmos were numerically ordered and planets moved in orbits that correspond with musical intervals, which created a harmony of space. I love this image of a musical world, with planets chiming chords in the sky. Throughout her lifetime Christianity and paganism were battling for control, and Hypatia wisely did not take sides. But in the ancient Roman empire, math, science, astronomy, astrology, and art, were not separate endeavors like they are today. Astronomy and astrology were linked, which associated Hypatia with paganism. The struggle between these religions embodied the tension between a free-thinking democratic society and authoritarian-leaning Christianity. To the new Christian leaders, teachers like Hypatia represented the old way of life and a threat to their envisioned future. Hypatia was nabbed by a mob, most likely the volunteer militia of monks known as the parabalani, and drug through the streets of Alexandria. She was brought to the temple that served as headquarters for Cyril, the Christian Bishop of Alexandria. There she was stripped, beaten and scraped with sharp pieces of oyster shells, and her limbs were removed. Then her remains were burnt in the streets in a mock imitation of a pagan sacrifice. It is widely believed that her death was commissioned by Cyril the Bishop to remover her influence over the citizens of Alexandria. Almost of of her writing and work was destroyed. Hypatia’s death marked the end of an era of creative thought and the start of a dark medieval period with an intellectual decline. It signaled the end of a democratic society and the rise of authoritarianism, a pattern which repeats throughout history. What does this mean for my time in this little cabin, when authoritarianism also feels as if it is on the rise? I want to honor her legacy of creativity and dedication to an intellectual life. Today may have been my most productive day yet. I wrote all morning, switched pieces, and kept writing. Then I went for a walk at Isabella State Park. I read a quote this week— somewhere in my reading—that said “writer’s walk.” That writer went on to discuss the importance of moving without music or a podcast as a distraction, to allow yourself to listen to thoughts that surface as your blood warms and moves. So this is what I did. I brought no headphones, but I did bring my phone to record notes. I had multiple revelatory thoughts about how to deepen and refine several pieces I am working on. In the symphony of this world I am composing my own small melody. It rings of greens and reds and browns, has the beat of deserts and forests, and is played in the key of landscape.